Television is a bit tricky to try to account for here. The only examples of the supernatural romantic melodrama I’ve been able to think of are on American television, where the lack of closure that’s a consequence of the production model even in cable makes sustaining a romantic melodrama difficult. Certainly in broadcast television, producing 22 episodes a season means that an exclusive focus on a single melodramatic plotline in a filmic sense is impossible. Either that plotline would quickly grow tedious without the variety provided by other stories, vying with the melodrama plot for screentime, and ultimately vitiating the emotional intensity film is able to generate through its singularity and intensity of focus; or the melodrama plot must be resolved, and so its centrality to the series abandoned. Largely because of this, most television series that work in this terrain at all do so only in part. They end up as far more mixed narratives as wholes, conglomerations of elements from across melodrama and fantasy, rarely if ever settling into one singular narrative or generic mode- or at least, not one with the specificity of the supernatural romantic melodrama. Though supernatural romances were certainly important to Bewitched (1964-1972) and I Dream of Jeannie (1965-1970), the first melodramatic treatment of the supernatural on American television must surely be Dark Shadows; yet as a soap opera that ran for 1,225 episodes over five years (1966-1971), one wouldn’t expect it to have spent that much time on a single plotline. I don’t know how much of it I’ve seen- 30 at the most, I’d think- but I can’t recall anything from those I saw that has much to do with the kinds of narratives I’m talking about. That said, the resemblance-to-lost-love aspect of the Dracula story (so focal to Coppola’s version in particular) appears to have been replayed here as Barnabas’ fixation on a waitress, Maggie, who resembles lost-love Josette. So the first genuine supernatural romantic melodrama on American screens, as far as I can tell, is Beauty and the Beast (1987-1990). While I can remember its existence, remember even that it got good notices at least at first, I can’t recall ever having seen a single episode. I am, then, wholly dependent on Teh Internets for whatever I can say about it; luckily, since Teh Internets is never wrong, I can speak with total confidence, secure in the knowledge that all the information on it has been subjected to rigorous peer review and is therefore wholly reliable. The economic demands placed on American television- to fill out long seasons, to sustain a show over several seasons with no definite resolution in sight, to remain accessible to new viewers- means that most shows that engage in sustained serial narration of necessity fit in episodic storytelling alongside it. A lot more, and, y’know, actual research would be needed on my part to be definitive here, but from what I can tell, the only real seriality in Beauty and the Beast concerns the central relationship itself, the premise for the show, which forms a narrative hub from which weekly plotlines developed. A lawyer, Catherine Chandler (Linda Hamilton) is attacked in Central Park. 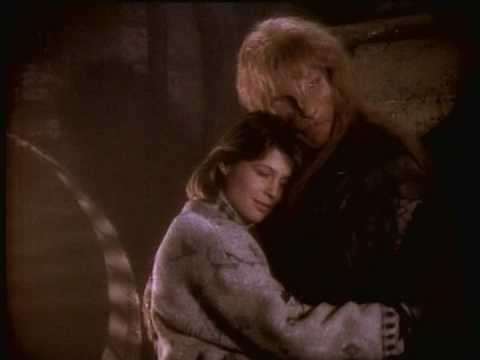 Left for dead, she is found by Vincent (Ron Perlman), the titular beast, who shows her a whole community of underground-dwelling outsiders living under the city. When she heals and returns to the above-ground world, she takes up self-defense, and takes a job as an assistant district attorney to go after the kinds of criminals who nearly killed her. Against the backdrop of a growing attachment between Catherine and Vincent, the show seems to have been a crime drama as much as a romance: every week, Catherine going after a new villain, and Vincent saving her from them when things get dicey. A given episode, or run of them, could be character-oriented, but routine crime-drama plots were always how the show sustained itself. Then too, in the third season Linda Hamilton got pregnant, and had to be written off. Catherine was violently killed; Vincent went into mourning; a female profiler for the police department investigating Catherine’s death replaced her. With ratings already in decline, the hole left by the abrupt end of the central relationship that had fueled the show meant that it was soon canceled. Almost ever contemporary televisual iteration of the supernatural romantic melodrama since follows the model of, and is profoundly influenced by, Buffy the Vampire Slayer (1997-2003). It’s the 800 lb. gorilla of the supernatural romantic melodrama on TV. In transforming the property from a mediocre film he had written into one of the canonical TV shows of its era, Joss Whedon also changed it from a coming-of-age comedy/horror story to a melodrama/horror story with comedy relief. The key relationship here, for my purposes, is of course that of Buffy (Sarah Michelle Gellar) and Angel (David Boreanaz), the ‘good’ vampire she meets in the first episode and soon falls in love with. Whedon pulls a masterstroke when Buffy and Angel consummate their relationship, only to have Angel fall prey to a spell that means that if he experiences total happiness, he will lose his soul. Fan art, including dialogue, of the aftermath of Buffy and Angel’s sexual consummation. The above happens in the middle of season 2. At the end of the season, Buffy must kill Angel- more precisely, send him to Hell- to stop his resurrection of a demon who will destroy the world, but as it happens she does so at the exact moment his soul is restored to him through another spell. Angel returns to Buffy the next season, but they can never be together again, lest he again lose his soul. Finally, after season 3, Angel gets his own spin-off; in season 4, Buffy goes to college; and there, she meets Riley, who is very much human. In season 6, Buffy carries on an intermittent sexual relationship with Spike, a not-very-good vampire; in season 7, Spike gets his soul back, and their relationship progresses, but as a subplot. After season 2, Buffy is never again so centrally a supernatural romantic melodrama; certainly that kind of melodrama never really leaves the show entirely- we can see it in Buffy/Spike, Xander/Anya, and Willow/Tara- but all those are subplots. Nonetheless, the power of the Buffy/Angel relationship is formative for later supernatural romances on TV. It’s at the core of the Sookie (Anna Paquin)/Bill (Stephen Moyer) relationship on True Blood (2008-present), which I gather has taken a number of turns since season 1, some involving Sookie and Eric (Stellan Skarsgard’s son). I wouldn’t know; season 1 took a while to click for me, and offered little incentive to return, which I never did. As well, at least the first season of True Blood is on some level as much a satire as a melodrama; where Whedon used horror as a vehicle for a bildungsroman, Alan Ball used vampires as stand-ins for homosexuals in a parody/critique of Southern American attitudes to sexuality. Buffy/Angel was a major influence on the romance storylines on Charmed (1998-2006), too. One witch sister, Piper (Holly Marie Combs), falls in love with Leo (Brian Krause), an angel (basically; in the parlance of the show, a “whitelighter,” a guardian of the realm of magic), and complications ensue; another, Phoebe (Alyssa Milano), falls in love with Cole (Julian McMahon), a demon, and complications ensue. At various times, Cole and Leo change from what they are to human and back again, with the attendant consequences for the relationships in question; more complications, more ensuing. Also, there’s a show called The Vampire Diaries. I gather it’s a sort of cross between Buffy and a sanitized True Blood. That’s all I know, and, until/unless forced to watch it, all I’m ever likely to know about it. I have no idea if there’s been a sustained romance plot on Supernatural, and likewise don’t really care that much one way or the other, though I do know defenders of the show. Most recently, Once Upon a Time (2011-) mines this fantasy/melodrama vein, premised as it is on fairy tale characters stuck with no memory of who they are because the Evil Queen (Lana Parrilla) cast a spell out of her jealousy of the relationship between Snow White (Ginnifer Goodwin) and Prince Charming (Josh Dallas); now all living in our world, the Queen/Mayor continues to manipulate events to ensure that they stay apart. Once Upon a Time’s first half-dozen episodes or so demonstrate the potential pitfalls of supernatural romantic melodrama on TV; in that time, it failed to establish any other storyline as central as the Snow/Prince/Queen triangle (the mother/daughter stuff between Snow White and Emma, Jennifer Morrison, never seemed to come center stage), and because too much progression too quickly in that triangle would affect the entire premise of the show, nothing ever seemed to develop at all. The resulting stasis- every step forward for Emma and Snow was matched by one step backward at the hands of the Queen- was both boring and frustrating for me, and I dropped out quickly. Compared to Whedon’s narrative prolifigacy on Buffy, where at some points he seemed to be burning up storylines with unfeasible, inadvisable speed, as if daring himself not to run out of ideas, and for viewers it felt at times like a high-wire act, Once Upon a Time seems too afraid of using up what few ideas it has, and so refuses to dispense with a single one. If Buffy inspired its own wave of supernatural melodramas, the comic playfulness of Buffy (and, to a lesser extent, Angel) can be felt as an influence on shows like Wonderfalls (2004), Pushing Daisies (2007-2009), Dead Like Me (2003-2004; it comes highly recommended, but I haven’t seen it yet), and Reaper (2007-2009), which play supernatural threats, and romantic barriers, as much or more for laughs than pathos. In Wonderfalls, Jaye Tyler’s (Caroline Dhavernas) newly acquired ability to hear voices that tell her to intercede in a given chain of events around her to effect a positive outcome (a different set of guest characters, events, and voices every week) certainly complicates her love life, but circumstantially; that is to say, there is not a supernatural barrier as such to her experiencing romance with her crush-object Eric (Tyron Leitso). Sam’s (Bret Harrison) responsibilities as a Grim Reaper on Reaper certainly get in the way of his romance with Andi (Missy Peregrym), but no differently than any other job that is both time-consuming and difficult to explain to your partner (Dead Like Me is also about Grim Reapers, I gather). 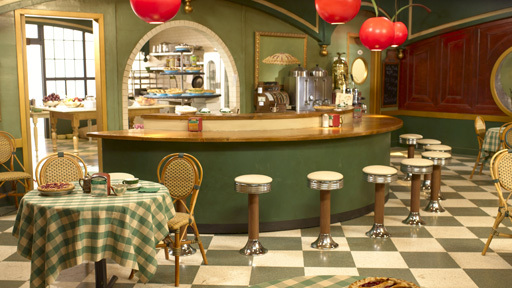 Of this set, Pushing Daisies is the most interesting by far, and the most melodramatic. It’s also the richest, most artistically successful show to date by its creator and executive producer, Bryan Fuller- whose previous credits include Dead Like Me and Wonderfalls, but who this time ran the show for a full two years (Dead Like Me ran 2 seasons, but Fuller left after 5 episodes due to ‘creative differences’). Ned (Lee Pace) has the ability to touch dead things, and bring them back to life. This comes with two major caveats: if he touches the formerly-dead thing again, it dies forever; if he doesn’t do so within one minute, something else in the vicinity will die to keep the cosmic ledger balanced. He discovered this ability as a child: when his mother died, he brought her back to life; because he didn’t touch her again within the allotted time, the father of neighbor girl/childhood sweetheart Charlotte “Chuck” Charles died instead; but then, having touched her again later, Ned’s mother died after all, and for good. Now running a pie shop (his mother was baking a pie when she died the first time; but one practical benefit of Ned’s ability is that he buys rotten fruit cheap and makes them fresh again), Ned has also fallen in with a private detective, Emerson Cod (Chi McBride); Ned brings dead people back to life, he and Emerson ask them who killed them, Ned touches them again, and then he and Emerson go collect the reward. One day, Ned hears of the murder of “Lonely Tourist Charlotte Charles” (Anna Friel) on a cruise ship (a supposedly fun thing she’ll never do again); and indeed, she is Ned’s Chuck, years later and all grown up. When he and Emerson go to revive her and find out who did her in (she doesn’t know, it turns out), Ned can’t bring himself to “kill” her again. They fall in love (Ned always loved her, of course, but Chuck quickly falls for him, too), they even live together, but can never touch for fear Chuck will be no more; often, this is played for comedy, but from episode to episode, the key note is pathos, as they search for and find ways to be together and express their love without actually coming into direct physical contact. In this scene, voiceover narration tells us that Ned and Chuck are holding their own hands but thinking of holding each others’. Unable to kiss, their monkey statues do so on their behalf. -until they discover uses for plastic. Moreover, Ned can’t bring himself to tell Chuck that he is responsible for her father’s death, which causes a set of complications which are played mostly for melodrama; and Chuck doesn’t dare tell her two maiden aunts, her foster parents and sole living family members (Swoosie Kurtz and Ellen Greene), that she is alive again, for fear it would reveal Ned’s secret; this causes a set of complications played mostly for comedy. Also, there’s Olive (Kristin Chenoweth), who works at the pie shop, and loves Ned. Since Olive hasn’t died, yet, there’s no complication there, but Ned doesn’t love Olive; also, though, he can’t tell her what is going on with him and Chuck, which, given that they don’t touch, causes Olive all manner of confusion and angst. This is mostly, but not always, played for laughs, in large part because of how Chenoweth plays the role. 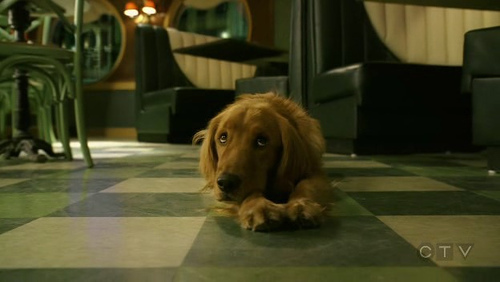 Another note of mixed pathos/comedy is provided by Ned’s revived dog, Digby, who he must pet with an articulated wooden hand from several feet away. The difficulty of verbally explaining this extraordinarily complicated premise is, no doubt, one reason that audiences couldn’t be lured to it, and that ABC didn’t stand by it, even though when you actually watch the show it seems perfectly simple. But it was also an extraordinarily idiosyncratic show, generically, formally, and stylistically. Any melodramatic elements were just one berry in the pie. Firstly, it was a hyperbolically styled, cartoonishly art directed show, one of a few in its decade; others include The Tick (2001-2002) and The Middleman (2008). Pushing Daisies was Barry Sonnenfeld’s 6th foray into television production, after Maximum Bob (1998), Fantasy Island (1998-1999), Secret Agent Man (2000; this is the first I’m even hearing of this one), the unjustly forgotten Karen Sisco (2004), and, most saliently here, The Tick. If Sonnenfeld’s direction of the Maximum Bob pilot was more in the relatively restrained mode of Get Shorty (1995), for The Tick he was very nearly as over the top as in the Men in Black films. 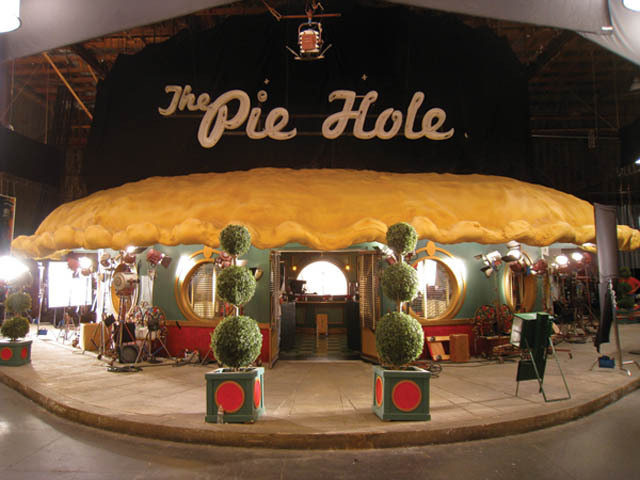 Sonnenfeld definitively set the visual style in Pushing Daisies, directing the first two episodes, and if anything they represent a high point of visual stylization for both American network television and Sonnenfeld. 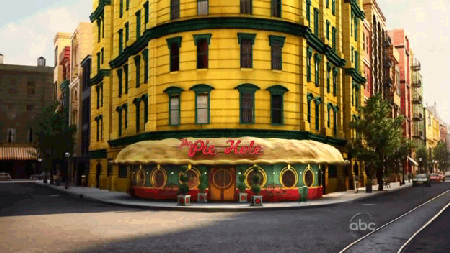 Pushing Daisies would consistently feature the exaggerated wide angle lens cinematography familiar from Sonnenfeld’s films (including those he shot for the Coen Brothers), along with hyper-saturated color, and elaborate sets combined with CGI to create a cartoony, fairy-tale world for these characters. Style in the show was at once expressive and ironic (Sonnenfeld has always talked about his use of wide angle as specifically keyed to comedy), as if the approach to Pushing Daisies had been borne of drugged-up viewings of 1950s Sirk melodramas (the music is a lush parody of soap opera and melodrama soundtracks). In this, it is keyed perfectly to Fuller’s scripts: undeniably sweet and often very moving both in conveying the obstacles to Ned and Chuck’s love, as well as Olive’s unrequited love for Ned, and the grief of the maiden aunts; but also full of macabre, black-comic touches (the typically grisly murder victims, and the ways they are dispatched), and with a constant sense of whimsicality (the name The Pie Hole, a car that runs on Dandelions, Emerson’s taste for knitting things like pistol holsters, etc., etc.). Fuller’s use of comic repetition in language is just one element that suffuses the storytelling with this whimsy: Chuck was murdered while on a cruise package sold to her by the Boutique Travel Travel Boutique; Chuck’s aunt’s were formerly stars of a synchronized-swimming act called The Darling Mermaid Darlings; and so it went. Throughout, an extensive use of voiceovers from an unseen narrator emphasizes the narrative artifice. Formally, the show is another example of “episodic seriality”: there would be ongoing enigmas, principally concerning relationships among characters, and built in to the premise (Would Ned tell Chuck that he was responsible for her father’s death? Will Olive figure out that Chuck doesn’t just look like but actually is murder victim “Lonely Tourist Charlotte Charles”? Will Chuck find a way to be close to the Darling Mermaid Darlings again? Why did Ned’s father abandon him, and will he ever return? More than anything, how can Ned and Chuck have a proper relationship without touching?). Such questions were increasingly prominent toward the climaxes of each season, but while relationships were always developing, narratives were mainly episodic, every episode centering on a new murder needing solving. More than anything, generically the show was a kind of super-quirky variation on the screwball/romantic mysteries of 1930s Hollywood film, more Nick and Nora Charles than Hart to Hart or Remington Steele. So, the romantic melodrama of supernatural barriers to love was ever-present, but almost always mediated at several levels of formal and stylistic remove: the mystery plots, the comedy, the stylization, the ironic cast of it all. Nonetheless, the key emotional note of Pushing Daisies, set by the Ned/Chuck relationship, was a classically melodramatic one of keen, sustained longing. A genuine innocence, sweetness, and poignant sense of longing always managed to come through it all, perhaps even accentuated by the layers of artifice, just as (for this viewer at any rate) the emotions in Wes Anderson films are made more powerful by the leverage provided by, and the contrast to, the stylized worlds in which those emotions are played out. One of the most adept and powerful post-Buffy genre shows (insofar as it used genre plots metaphorically in relation to characters’ lives) was J.J. Abrams’ Alias, in which he used an overarching espionage plot to explore how character relationships were marked by deception and manipulation: when not lying to each other, most characters were hiding things from most others, and generally maintaining a carefully cultivated façade to obscure their truest goals and emotions. Lost (2004-2010), executive-produced by Abrams but principally the creation of co-writers and –producers Damon Lindelof and Carlton Cuse, likewise uses genre narrative as a vehicle for exploring larger issues, but with a much broader, more abstract fetch: Lost is variously concerned with identity, the ties between us (along with The Wire, it’s one of TV’s most complex “network narratives”), morality, responsibility, and commitment. Until its last season, it was never clear whether Lost was at base a science-fiction show or a fantasy show (alongside its action plots, crime/mystery plots, melodramatic plots, etc. ); it finally did resolve into a fantasy narrative, and in doing so revealed the extent to which the whole construction functioned on the level of the symbolic. Though the shifting time frames and machinations on the parts of various players formed a barrier to relationships like those of Kate (Evangeline Lilly), Sawyer (Josh Holloway), and Jack (Matthew Fox), the principal example of the supernatural melodrama plot was that of Desmond (Henry Ian Cusick) and Penny (Sonya Walger). Desmond and Penny in better times, Lost. The obstacles presented to their relationship by her father’s (Alan Dale) hostility to Desmond were nothing compared to Desmond being stuck on the Island, which for purely supernatural reasons spelled a potentially permanent separation from Penny. Those moments in which they did manage to reconnect despite the barriers between them were among the most emotionally satisfying on a show that relied on character relationships to provide emotional touchstones in the midst of what was an often bewildering narrative arc across the series. (The extent to which it did and continues to bewilder some viewers is demonstrated by the persistent and entirely wrongheaded reading that the passengers of Oceanic flight 815 died in the plane crash and The Island was Purgatory.) Certainly, the Desmond/Penny plot is one of the most vivid and moving supernatural romantic melodrama plots on recent television. In fact, in my viewing, its nearest rival in the last few years has been on another Abrams show. Unfortunately for my purposes, it’s not really a “supernatural” plot at all. Not technically, anyway. Fringe, again executive-produced by Abrams but principally created by former Alias writers Alex Kurtzman and Roberto Orci, is explicitly a science-fiction show, so titled for its basis in the concept of “fringe science,” the iterations of which on the show are at least supposed to be extrapolations of the more out-there of current theories on the subjects it depicts. The principal concept of the show is that of multi-dimensionality: parallel Earths each of whose existence threatens the other. The first few seasons depict a kind of Cold War between the parallel Earths which always threatens to heat up; the question is, Can the Earths co-exist, or must the existence of one necessarily mean the destruction of the other? The inciting incident in all this is that the Walter Bishop (John Noble) of our world, an eccentric scientist, finds a way to bridge the gap between worlds after his son Peter dies of an illness. When the Other Peter Bishop develops the same illness, Walter kidnaps that Peter to save him- only he never takes him back, raising that Peter as his own, and earning the lasting enmity of the Other Walter when the latter figures out what happened. Decades later, Walter, Peter (Joshua Jackson), and Olivia Dunham (Anna Torv), an FBI agent in the Fringe Division, must deal with the consequences, opposing the efforts of the Other Walter and the Other Olivia- whom they dub “Walternate” and “Fauxlivia”- to destroy their world. In the course of this, Peter and Olivia fall in love. The finale of season 3 takes the team to the Other Earth for an extended adventure, but at its conclusion, Olivia is imprisoned by Walternate, and Fauxlivia comes back in her place. Where Olivia and Peter had only begun to explore the nature of their feelings for each other, Fauxlivia and Peter quickly commence an affair. When Fauxlivia is found out, and returns to her Earth while Olivia returns to ours, Olivia finds out that Peter and Fauxlivia had had a relationship, and this provides another obstacle to them. They begin to move past this by the end of season 4, but in the finale, Peter activates a mysterious machine which results in his existence being erased from both worlds. When Peter manages to reinsert himself into spatiotemporal continuity with his memories intact, Olivia no longer knows him, as he’s never existed before- and once again, their relationship has been stopped in its tracks. In the storyworld of the show, these barriers are scientific in their basis, and so technically Peter and Olivia are not an example of supernatural barriers to romance- but that science is so sketchily defined, so far outside of the bounds of any scientifically verifiable realm of possibility or plausibility, that they might as well be. And like Penny and Desmond on Lost, like the exceedingly complicated and emotionally charged father-son relations here, this relationship is a primary anchor for viewer investment in the series narrative. Next time: contemporary arthouse cinema. Thanks to Jo Murphy for her suggestions for this entry. Great post! A couple other short-lived shows you might consider would be “A Gifted Man,” which I haven’t seen, lasted only one season, and which did not look very good, and “Eli Stone,” which played down the romance in favor of do-gooder heroics. Both involved visions that might be hallucinations (in one case, the ghost of the main character’s wife; in the other, various visions possibly brought on by an aneurysm. Not the greatest shows every, or all that popular, but possibly within the genre. Cupid: more of a “maybe” supernatural / “maybe” romance, with the main character believing that he’s a supernatural being, but his psychologist/potential love interest believing otherwise. Roswell: I haven’t watched much, but if you consider aliens as supernatural, that’s definitely a dynamic. What about superheroes? If they count, Lois & Clark and Smallville are worth throwing into the mix. And if you’re interested, Henry Jenkins’s Textual Poachers has an excellent chapter on Beauty & the Beast.